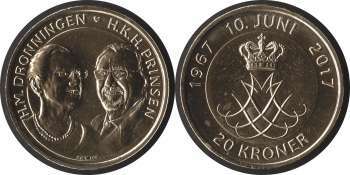 Both sides were engraved by Henrik Wiberg. The quality is almost proof. 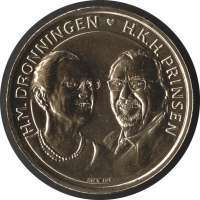 The obverse features a portrait of the couple, with the Queen and the Prince in three quarter profile, facing each other. 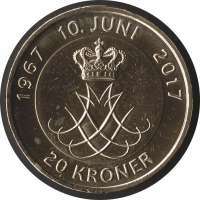 The reverse motif is the joint monogram of the Queen and the Prince. Above it, the date and the years of the wedding and anniversary are shown. Below the monogram is the Mint's heart, which is also the symbol of love.